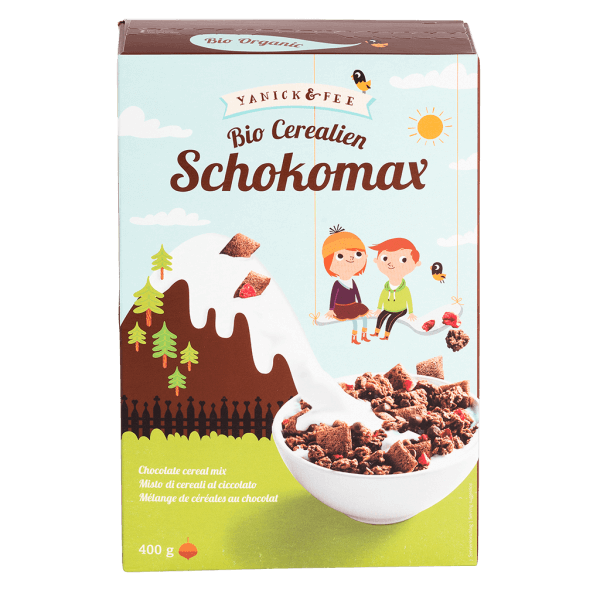 Attention, chocolate friends: -15% on products for the chocolate breakfast. Valid for all shop customers. This promotion runs from Monday, April 15th to Sunday, April 21st 2019. Gently toasted chocolate crunchy muesli and chocolate pockets, blended with whole milk chocolate chips and freeze dried strawberry pieces. 100% organic with a wonderfully chocolatey crunch. Good morning! Chocolate crunchy* 90% (wholegrain oat flakes*, raw cane sugar*, wholegrain wheat flakes*, high-oleic sunflower oil*, milk chocolate* 3% (sugar*, whole milk powder*, cocoa paste*, cocoa butter*, sweet whey powder* (milk), emulsifier: sunflower lecithin*), wholegrain crisped rice*, dark chocolate* 2% (cocoa paste*, sugar*, cocoa butter*, emulsifier: sunflower lecithin*), cocoa powder* 1%, coconut shreds*, salt), chocolate pockets* 8,5% (cereals* (wheat flour*, rice semolina*, oat flour*, sugar*, vegetable oil* (palm*, rapeseed*), cocoa powder*, chocolate* 4,5% (sugar*, cocoa powder*, cocoa butter*), skimmed milk powder*, sea salt, emulsifier: rapeseed lecithin, natural vanilla flavouring*), chocolate drops* 1% (sugar*, whole milk powder*, cocoa butter*, cocoa paste*, vanilla powder*), strawberries*. > May contain traces of sesame, soy, lupines and other nuts. Best enjoyed with fresh fruit, milk, yoghurt or quark. Also great as a topping for cream or ice-cream desserts.